Labbé St-Vincent, Simon Blais, André Foucault, Martial Laslier, Jean-François Sauger, Nicolas and Van der Straeten, Karine 2016. Voting Experiments. p. 287. Arenas, Andreu 2016. Sticky votes. Journal of Economic Behavior & Organization, Vol. 132, Issue. , p. 12. Bouton, Laurent and Gratton, Gabriele 2015. Majority runoff elections: Strategic voting and Duverger's hypothesis. Theoretical Economics, Vol. 10, Issue. 2, p. 283. Toulouse School of Economics (CNRS-GREMAQ) (email: karine.van-der-straeten@tse-fr.eu); Centre d’études européennes, Sciences Po, Paris; Département d’Économie, École Polytechnique; Département de science politique, Université de Montréal, respectively. The authors thank the French Agence Nationale de la Recherche (Project ‘2 Tours’, co-ordinator: Annie Laurent), the Social Sciences and Humanities Research Council of Canada (Project ‘Making Electoral Democracy Work’, co-ordinator: André Blais), the Center for the Study of Democratic Citizenship, and the Centre pour la recherche économique et ses applications (CEPREMAP) for their financial support. Supplementary data is displayed on the Journal's website at http://dx.doi.org/doi:10.1017/S0007123412000579. 3 Duverger, Les Partis politiques. 4 A Condorcet winner (CW) is an alternative defeating any other alternative in a pair-wise comparison using the majority rule. 9 In Montreal and Paris, the subjects were students (from all fields) recruited from subject pools (subject pool from the CIRANO experimental economics laboratory in Montreal, and from the Laboratoire d’économie expérimentale de Paris). In Lille, the experiments took place in classrooms, during a first-year course in political science. 10 Under the plurality system, each voter votes for one candidate; the candidate getting the highest number of votes is elected (ties are broken randomly). Under the majority run-off system, on a first round, each voter votes for one candidate. If a candidate gets an absolute majority, he is elected. If not, a second round is held between the two candidates having obtained the highest two numbers of votes in the first round (ties are broken randomly). On the second round, each voter votes for one candidate; the candidate getting the highest number of votes is elected (ties again are broken randomly). 11 Participants are also paid a fixed sum of 5 euros for attending the experiment. 12 Note that if subjects were to vote sincerely in plurality elections (or in the first round of a run-off election), the distribution of votes among candidates would be almost uniform. In expectation (with ties broken randomly), the extreme candidates, A and E, would each receive 4 votes, each of the moderate candidates, B and D, would get 4.5 votes, and the Condorcet winner C the remaining 4 votes. 13 All the results that are reported in this article collapse the experiments held in Canada and France. The patterns are very similar in the two countries. They also merge sessions where the first series of elections is held under plurality and the second series under run-off systems (11 sessions), and those where the reverse order is used (12 sessions). The results turn out to be the same whether a given rule is utilized first or second. 14 During the experiment, ties were broken randomly. In the analysis, for reasons of consistency (see below), in case of such a tie, we reason in terms of probabilities. Consider, for example, the following scores: A:0, B:7, C:7, D:6, E:1 in a plurality election. There is a tie between candidates B and C. We then compute that with probability $$$\frac 1 2$$$ , candidate B (or C) is elected. 15 As in plurality elections, we take care of actual ties by reasoning in terms of probability (cf. fn. 14). Besides, to compute the effects of run-off, we assume that the CW candidate is elected whenever he is present in the run-off. This is indeed the case in more than 95 per cent of the elections in our experiments. Consider for example the following scores: A:0, B:8, C:6, D:6, E:1 in the first round of a run-off election. There is a tie between Candidates C and D to decide which candidate will go to the runoff. We then compute that with probability $$$\frac 1 2$$$ the run-off is between B and C, in which case C is elected with probability 1, and with probability $$$\frac 1 2$$$ , the run-off is between B and D, in which case C is not elected. With such a distribution of votes, we say that C is, therefore, elected with probability $$$\frac 1 2$$$ . We do this to have a consistent method when we perform counterfactual simulations. 16 Preliminary tests have shown that outcomes under plurality and outcomes under the run-off rule within the same session are not correlated. If one is to assume that observations within series of elections are also independent, the appropriate test is a proportion test on two independent samples, where C is elected in 45 cases out of 92 in plurality elections, and in 53 cases out of 92 in run-off elections. The test statistic is 1.18, with a two-tailed p-value of 0.24. The difference is not significant. Now, because of some learning and co-ordination effects going on within series of elections (see the following section), observations within series are likely to be correlated. In that case, we rather take as the observational unit the average probability of Candidate C being elected within a series of elections. The two-tailed Student's t-test p-value is 0.46: again we cannot reject the hypothesis that the means are the same in the two samples. 17 We perform similar tests as for the total effect (see fn. 16), treating the two samples of plurality and run-off elections as independent. If we consider all elections as independent, C is elected in 53 cases out of 92 in run-off elections, and he would be elected 67 times out of 92 if we applied the run-off system on actual plurality votes. The test statistic for a proportion test is −2.17, with a one-tailed p-value of 0.015. Now, rather taking as the observational unit the average probability of Candidate C being elected within a series of elections, we also perform a Student t-test. The one-sided Student's t-test p-value is 0.11: we accept at 11 per cent the hypothesis that the psychological effect is negative. 19 We computed the average effective number of candidates at each date, for each voting rule. For plurality elections, this number drops from 4.08 at the first election, to 3.3 at the second, 2.88 at the third and 2.53 at the last. For run-off elections, the average effective number of candidates is 4.28 at the first election, 3.54 at the second, 3.33 at the third and 3.2 at the last. 20 This behaviour is consistent with voters voting according to Cox's M + 1 rule, where M is the magnitude of the district. Indeed, even if only one candidate is finally elected in our candidate elections, the magnitude of the run-off system can be seen as equal to two, if viability is determined by the access to the run-off. Note that, under plurality, voting for one's preferred candidate among the two viable candidates coincides with fully rational strategic voting, whereas under a run-off system of elections this behaviour (sincere voting within a restricted menu of three viable candidates) is not consistent with voters being fully rationally strategic (for example, because there is no point in voting for a candidate who is sure to be part of the run-off); see Cox, Making Votes Count. In Van der Straeten et al., ‘Strategic, Sincere and Heuristic Voting under Four Election Rules’, we explicitly test for the hypothesis of fully rational voters, and conclude that the behavioural rule described here (sincere voting within a restricted menu) outperforms the rational model in explaining the data. 21 This can be explained by the fact that at the first elections of each series, a large proportion of voters votes sincerely. If voters vote sincerely, the distribution of votes among candidates is almost uniform (see fn. 12). 22 See Blais, ‘The Debate over Electoral Systems’. 23 Morton and Rietz study three candidate elections, where a majority of voters are equally split between two close majority-preferred candidates, and the remaining voters prefer a third candidate (Morton and Rietz, ‘Majority Requirements and Minority Representation’). They show that the minority candidate is less likely to be elected under run-off than under plurality elections. Indeed, in plurality elections, the majority voters may fail to co-ordinate successfully on one of the two majority candidates, whereas in run-off elections, since one of the two majority candidates is always part of the run-off (when there is no direct winner on the first round), the Condorcet loser cannot win. These divergent results are due, we believe, to the different preference distribution and candidate locations in the two experiments. Whereas Morton and Rietz's study essentially features a co-ordination game between the two groups of majority voters, ours describes a situation with a more fragmented electorate, where the Condorcet winner can be ‘squeezed’ between two moderate candidates. 24 In our laboratory experiment, we detect a strong psychological effect. How is it expected to compare to what would happen in real world elections? In the experiment, monetary payoffs are used to induce preferences over the set of candidates. The nature of those monetary-induced preferences may be different from voters’ true political preferences, and people might be more tactical in our experimental setting than in real world elections. Furthermore, in our experiment, elections are repeated by series of fours, allowing subjects some time to adapt and co-ordinate. Lastly, we use students as subjects, who are likely to have stronger cognitive skills than non-student subjects and, therefore, may engage in more strategic thinking. 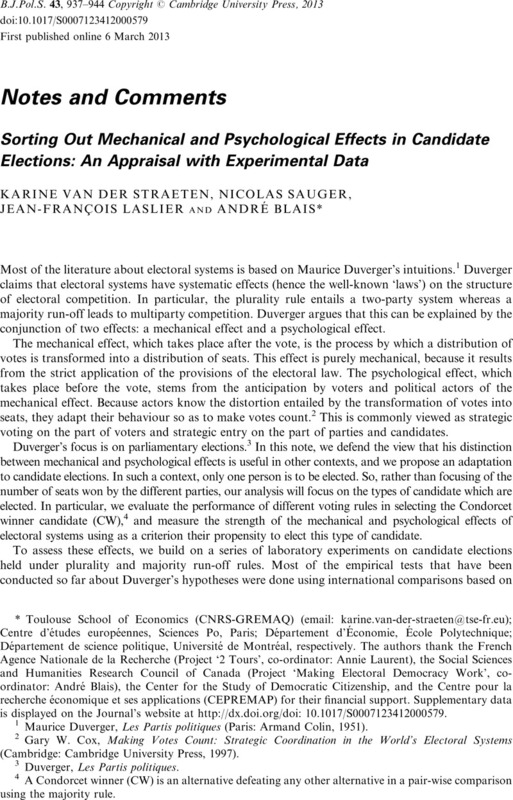 Thus, we believe that, compared to real elections, our experimental results probably provide an upper bound for the size of the psychological effect. * Toulouse School of Economics (CNRS-GREMAQ) (email: karine.van-der-straeten@tse-fr.eu); Centre d’études européennes, Sciences Po, Paris; Département d’Économie, École Polytechnique; Département de science politique, Université de Montréal, respectively. The authors thank the French Agence Nationale de la Recherche (Project ‘2 Tours’, co-ordinator: Annie Laurent), the Social Sciences and Humanities Research Council of Canada (Project ‘Making Electoral Democracy Work’, co-ordinator: André Blais), the Center for the Study of Democratic Citizenship, and the Centre pour la recherche économique et ses applications (CEPREMAP) for their financial support. Supplementary data is displayed on the Journal's website at http://dx.doi.org/doi:10.1017/S0007123412000579.